There's a saying or myth or theory that our bodies are completely regenerated every seven years, meaning the cells that you had seven years ago have been completely replaced. Basically, we are not the same "people" that we were seven years ago, at least from a biological standpoint. In October 2002 I started my "loc journey", and in October 2009, I ended it. If you have locs or know someone who has locs, you will often hear the concept that locs transmit and hold energy, both positive and negative. 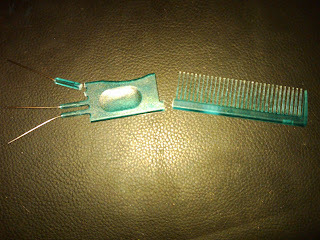 Honestly, when I first started locking my hair, I thought this was a bunch of malarkey. But as time went on I started to notice that when I was in a good mood and happy, my locs looked fantastic. When I was feeling crappy or was sick, they acted a fool. I could use the exact same grooming regimen, the exact same styling techniques, and the exact same products, but my mood made the ultimate determination as to whether they would look great or just okay. As I've alluded to in previous posts (and discussed in depth in my predecessor blog), I've been through A LOT of challenges and hard times over the past three years, primarily dealing with a divorce and career implosion. My locs would have their good days and bad days, but I could always manage to get them back to looking good. Well, in the past few months, they finally crapped out on me. In the past several weeks I've been dealing with a tremendous amount of sadness and regret and hurt stemming from my own bad decision making, and I really, really hurt someone I love very much over things that were from or should have remained in the past. I got fed up with myself and fed up with my baggage and fed up with EVERYTHING and went on a delete and purge mission. Contact numbers.... deleted. E-mail and chat...... blocked and deleted. Old pictures transferred from one Blackberry to another..... deleted. Then I turned to myself..... deleted my blog dedicated to my experiences with my divorce, deleted my Twitter account, and I told myself once and for all that I was going to be the person that I KNOW that I am, not this person that got mired down in drama and hurt and negativity. Whenever I'm feeling particularly stressed I feel an urge to cut my hair as a means of freeing myself from negativity, but I (luckily) never had the cajones to do it. But last week I finally looked at my locs and said "You have got to go." My scalp was a dermatological nightmare, my locs were thinning (several of them had to be "married" to the adjacent loc so they wouldn't fall out), and they just stuck out every which way. They just started to feel like a weight that I had to get out from under. I knew that this was unlike the previous feelings I'd had about them before..... this time was for real. I felt like if I were truly committed to change and growth, I had to get rid of the locs that were holding years of negative energy. At first I was just going to cut them off myself down to the roots... the urge was very strong because I just wanted them GONE, but I didn't want to be rash and end up really regretting my decision. I really wished I had someone close to me that could have helped me.... I've heard of people having friends and loved ones do the honors, but honestly, I had nobody around who would really understand. I also have NO money to pay a professional to do it, but I thought I'd ask my loctician anyway to see how much he would charge. He told me that if I allowed him to do a "trend cut" and take pictures that he would do it for free (he's VERY artistic and does these wild, impractical styles on his clients who are about to cut their locs off anyway) which I was excited about, but then I didn't hear back from him after asking when he thought he could do it. I was literally getting panicked at the thought of having to go several more weeks. So I took that as a sign that this was something that I would have to do myself.... that I NEEDED to do myself. 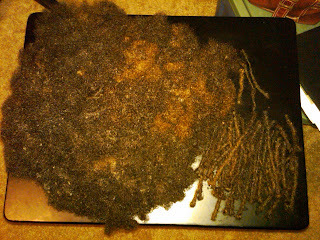 The way I went about removing my locs I would NOT recommend to anyone unless you have a helluva lot of patience and the texture of hair that would allow for it. Basically, I unraveled my locs. Call it vanity or whatever, but I really was not looking forward to the idea of having to sport a TWA (teenie weenie afro) for a few months, but I was willing to do it, particularly considering that I somewhat wanted to make myself less "hollerable" (i.e. no desire to get back into the dating game any time soon.... not saying that guys don't like short naturals, but I think I personally look better with longer hair). I knew from years of having the ends of my locs unravel about 1/2 cm or so every time I washed them that they would come undone with only a slightly unreasonable amount of effort. I went and got some detangling shampoo, some Organic Root Stimulator Hair Mayonnaise Deep Conditioner, and some metal picks and got to work. First I cut about 5" off the back, which was longer because of the way my hair had been cut, making the locs all the same length in a bob just above my shoulders. 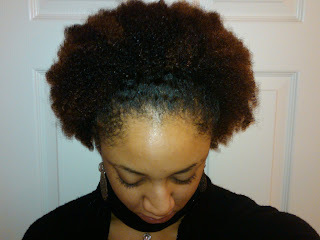 Then I washed and conditioned my hair, leaving the deep conditioner on for about 2 hours to soften up the locs. I was going to cut the locs down to about 2" of loc'd hair, but then I tried one test loc to see if I could undo it without cutting off any more length, and sure enough..... I could. You can see the only part of my loc that I actually cut.... not very much. I was actually really proud of how little buildup I had in my locs, thanks primarily to my loctician's insistence that no products are necessary to loc your hair, and a little product, if you use anything at all, goes a LONG way. Also, I washed my hair a lot.... actually more than I ever did when I had a perm, which is contrary to what many people believe about people with locs. I'd hate to see what this would have looked like if I'd used some heavy wax or pomade to loc my hair. 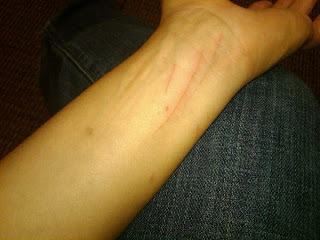 That's from the pick slipping and the metal pick scraping across my skin (and yes, it still stings). My thumb is gouged up as well from holding each loc and pushing the metal prongs through each one over and over and over. I ended up with quite a bit of hair left, enough to pull into a small ponytail. And being that I didn't do much cutting, I still maintained a decent shape and don't really need to trim it up (for now). So..... my "crowning glory" is gone. My attribute that got me the most (publicly verbalized) compliments is no more. This was my sacrifice to myself, to my life, to karma, to everyone I've loved and everyone I've hurt. This isn't lip service, loved ones. This is REAL. For now I shall sport my natural, but one day I do plan on going back to locs. They are just "me". It was just time for that first set to go. Although I loved my locs and will probably miss them, I'm content with my decision. I'm sure many people won't understand it, and think I was nuts for cutting my "long pretty hair" (I'm NOT looking forward to my 90 year old grandmother's reaction). A few people know where I'm coming from, and those are the people I really count amongst my friends. I can't believe that someone else unraveled their locs. I just did mine...about 15 days ago. It took me 6 days and I will NEVER do it again. There is something to that whole "energy" thing. I literally felt like the spirit of heaviness lifted off of me when I washed out all the shed hair. It was probably the best decision I've ever made. It has changed my life and the way I see myself. I'd encourage anyone with locs to try it! I mean...what do you have to lose?